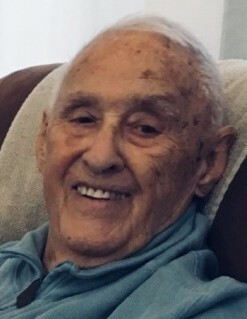 Joseph Louis Gasparich (Bud), age 95, passed away peacefully on March 21, 2019 at the Joliet Area Community Hospice Home with his family by his side. Joseph was born in Joliet, IL to Mary (Plese) and Matthew Joseph Gasparich. He had an older sister, Marie (Frank) Spesia, and a younger brother, Thomas(Mary) Gasparich, all deceased. Joseph attended Saint Mary’s Nativity Grade School and Joliet Township High School. His childhood nickname was “Knute” after his hero, Knute Rockne, and for his love of Notre Dame Football. Immediately following graduation, Joseph enlisted in the US Army. He became a Technical Sergeant in the 555th Engineer Heavy Ponton Battalion which served in the European Theatre during World War II. The 555th battalion built bridges for the infantry and mechanized troops in France and for the Rhine Crossing into the heart of Nazi Germany. After the war, Joseph became an electrician and worked at US Steel for 40 years where he was a union organizer and then served as its Treasurer. Joseph was a talented baseball player and played on several Joliet championship teams. His great athletic rhythm and eye helped him bowl a perfect 300. At Saint Joe’s Park, Joseph met the love of his life, Helen Lazar. They were married in 1949 and remained faithful partners until Helen’s death in 2011. They had eight children. Joseph was a loving husband and a wonderful father. He always put his family first. He instilled the importance of education and he believed his children could achieve anything that they set their minds to. Joseph became an accomplished golfer and played in leagues until he was 85. As a lifelong fan, he relished in the Chicago Cubs World Series victory. Joseph was also an avid reader and an astute investor. However, Joseph’s highest accomplishment was his unwavering faith in God and to the Sacred Heart of Jesus. Joseph will be remembered for his beautiful smile, his remarkable memory, and his passion for music. Joseph was preceded in death by his wife, Helen; his oldest son, Joseph A. (Anna) Gasparich; and his dear grandson, Matthew Joseph Gasparich. Joseph is survived by his children, James (Mary Jo), Mary Beth (Rusty) Jessee, JoAnn(Leonard) Rittof, Robert(Adriana), William, Micki (John) Naal and Patty (Scott) Multack; and daughter in law, Anna Gasparich. Joseph has a surviving brother and sisters-in-law, Mary (Peter) Lazar and Anne and Richard Thayer. Numerous cousins, nieces, and nephews also survive. Joseph was an adoring grandfather to Christina (Andrew) Witt, Stephanie (Chico Gersappe) Gasparich, Sara (Hendrick) Van Hemert, Joe Jessee, Danielle (Steven) Houston, Nicole, Kelley, and Jacob Gasparich, Austin, Nate, and Jack Naal, Adrianna, Christopher, David, and Erica Diviero. Joseph’s great grandchildren are Alex and Ryan Witt, Aleta Van Hemert, and Emma Houston. Private funeral services will be conducted at a future date. Memorial donations in Joseph’s name can be made to Honor Flight Chicago Corp. 9701 W Higgins Road, Suite 310 Rosemont, IL 60018-4703.